In December Google released a graphing calculator in the search results. Google has just stepped that up by adding an animated and interactive version of their graphing calculator. If you search for [sqrt(x*x+y*y)+3*cos(sqrt(x*x+y*y))+5 from -20 to 20], [sin(5.5x)*cos(5*y)+x*x+1 x is from -1 to 1, y is from -1 to 1, z is from 0.1 to 2.8], [tanh(y(y^4+5x^4-10(x^2)(y^2))/(x^2+y^2)^4)] or similar calculations, Google will now animated them and let you see them in 3D. Google shared this on their Google+ page and some note it is very similar to WolframAlpha - it is. But Google animated the graphs while Wolfram doesn't - well they do, but you have to pay for it. 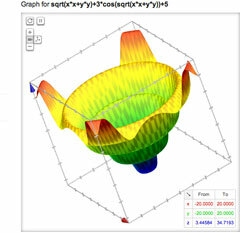 Just type any real two variable function into Google to see a dynamic, interactive, three dimensional plot. Click anywhere in the graph to rotate it to check out different angles, or scale the view by zooming in or out, or by editing the range in your equation or in the lower-right legend box. For example, if you're a student studying advanced calculus, the ability to see a three dimensional graph will help you get a better visualization for real two variable functions. This feature is enabled by a technology called WebGL, which we’re using for the first time in Google Search. WebGL is a new web technology that brings hardware-accelerated 3D graphics to the browser without the need to install additional software. This technology is currently supported on modern web browsers such as Chrome and Firefox.